The stochastic oscillator measures the closing price of a candlestick against the average closing price of a certain amount of candlesticks before it. For example, it shows whether this candlestick is overbought or oversold as far as the overall range of the market is concerned. This momentum indicator is not to be used in a trending market, but rather a market that has been going sideways. While there are strategies that use them with trends, that is less normal than looking at this as an opportunity to confirm or ignore support or resistance. The stochastic oscillator is shown in a window at the bottom of the chart, separate from price. It has two lines which act like moving averages, the crisscross the panel. The standard situation is to see the 20 and the 80 level marked as both the overbought and oversold condition. Occasionally the indicator will crisscross the lines above the 80, which of course is the overbought condition, or below the 20, which is the oversold condition. This is how most people will use stochastic oscillators, as a sign that perhaps it’s time to buy and sell based upon a resumption of what we seen over the last several candles. However, in a trend this reliability tends to disappear. It is because of this that you will often see stochastics offer more reliability when you include support and resistance. Sometimes, people will use the stochastic oscillator for finding divergence. Divergence is when the momentum of an asset isn’t matching the price. For example, we could be seeing “lower highs” in the stochastic oscillator, but “higher highs” in the price window. This shows that perhaps the underlying momentum is starting to slow down. Looking at the chart below, you can see that the Euro has been rallying against the Polish zloty over the last several candlesticks, but at the same time the “highs” in the stochastic oscillator are getting lower. This suggests that perhaps the momentum is slowing down and it could lead to a selloff. This isn’t reason enough to start shorting the market, but it does give you a bit of a “heads up” as to what could happen. One of the things that attracts many people to Forex trading is the potential for significant profits in a relatively small amount of time due to the use of leverage. However, with the potential for gains comes a significant potential for losses that must not be overlooked. To protect your account, it's a good idea to look at the bigger picture, which means not just eying the potential profits, but looking for ways to trade in a way that has lower risk. Your rewards may be lower in the short term, but with a low risk Forex trading strategy you will hopefully see more success in the long term. Think of it this way: there is no business that you can get into that doesn&rsquo;t have a certain amount of risk. For example, if you decided to open up a convenience store, there is also the possibility that you could not make enough money to keep the doors open. However, if you do the right research and make the right business decisions, you increase your likelihood of building a successful business. In this sense, your trading business is very similar. You must do proper market research in order to make solid trading decisions. You'll still have some risk when you trade, but the risk will be reduced by your own understanding of the markets and how they move. I am happy that you guys are sharing your experiences with us. Traders will require adequate trading understanding to ensure rational decision making process. Again, a forex trader must try to attain sufficient trading knowledge with the help of various learning tolls. And in the present time, forex forums are being established as an educational tool for the traders where expert traders are sharing their reviews and suggestions to the beginners. Many Forex traders focus too narrowly on the currency pair or pairs they are trading. While it is important to be focused on a short-term chart if you are trading something on a short-term time horizon, it can help your profitability a lot if you look at the market in a broader way, as part of your process of deciding which currency pair to trade, and in which direction. Although it is possible to do OK by only looking at the Forex market, you could do better by considering what is going on in stock and commodity markets too when you analyze the Forex market. One reason why would be if there were a statistical correlation between the movement of the stock market and certain currencies or commodities. Furthermore, if such correlations can be found, it might be that they become even stronger or weaker under particular market conditions. This should be useful information for Forex traders as it can be used to move the odds in their favor. Correlation is simply the measurement of how much the prices of two different things have moved in the same direction over the same time. For example, if the prices of A and B always go up or down by the same percentage every day, completely in sync, then A and B would have a correlation coefficient of 1 (perfect positive correlation). If they always move in precisely the opposite directions by the same amount, they would have a correlation coefficient of -1 (perfect negative correlation). If there is no statistical relationship between the price movements of A and B at all, they will have a correlation coefficient of 0 (perfectly uncorrelated). I won't detail the full formula of how the correlation coefficient between two variables is calculated here: it is enough to note that when such a statistical relationship can be proven over a long time period, we may be able to say that this relationship is likely to continue for some time in the future. However, it is important to understand that there are times when market correlations seem to break down entirely, so it is probably best to use correlation as a filtering tool for trades and not as the basis of an entire trading strategy. We can best illustrate the concept of using correlation between a stock market and currencies by taking the major U.S. stock market index, the S&P 500, which measures the valuation of the 500 largest publicly quoted U.S. companies by market capitalization and checking its statistical correlation with some Forex currency pairs which are priced in USD. That way, we can easily see the simple correlation between the non-USD currency and the stock market as measured by this index. As an additional step, we can also see whether the correlations were different during bear market periods, which are defined as the periods during which the market falls by at least 20% in value. Bull markets are defined as the periods during which the market rises by at least 20% in value. I used the time period from 2001 to the end of November 2019, a period more than 18 years long. The correlation coefficients between the S&P 500 Index and certain currencies and the precious metal, gold, are shown in the table below. So, what does this data tell us? Starting with the leftmost column which shows the correlation over the entire period of almost 19 years, we can see that the strongest correlation between the U.S. stock market and major currencies is a negative correlation with the Japanese Yen, with a correlation coefficient of -0.31. This is a strong negative correlation, and suggests that when the stock market rises, the Yen tends to fall, and vice versa. Now let&rsquo;s look at the rightmost column, which is the average of the correlation coefficients measured during the four bear markets which have occurred since 2001. Interestingly, the negative correlation is even stronger here, at -0.42. This suggests that when the U.S. stock market is selling off, the Japanese Yen is even more likely to rise in value than it is to fall when stocks are rising. This suggests that the Japanese Yen has tended to act as a &ldquo;safe-haven&rdquo;, i.e. something money flows into when stock markets are riled up and selling off, which often occurs during episodes of crisis. In addition to the Japanese Yen, I also included two other assets typically seen as safe-havens: the Swiss Franc, and Gold. The Swiss Franc has a very slight negative correlation overall with the S&P 500 Index of -0.07, which gets just a little stronger during bear markets. This suggests that the Swiss Franc is maybe not as much of a safe-haven as its often thought to be yet is still has a (small) negative correlation with stocks. Turning to Gold, the case gets stronger: overall, it is perfectly uncorrelated with the S&P 500 Index, but in each of the four bear markets analyzed, there was a significantly stronger negative correlation. Finally, I threw in the Euro just for variety, and it seems to go up when stocks go up, and down when stocks go down, so it doesn&rsquo;t look like much of a safe-haven over the full period. Let’s start with the advantages of trading a small account. The most obvious benefit to trading a small account is that you do not need to worry about moving the market against yourself if you jump in and out of it. If you are trying to close out a 10,000 unit position, you are going to have much trouble doing so at just about any price. However, if you are trying to trade 100 million unit position, it’s an entirely different situation. In this sense, the small trader has much more flexibility when it comes to putting a position on or off. There are a multitude of disadvantages for a small account. The most obvious one is that it’s going to be difficult to make the rewards worth your time. For somebody who makes $100,000 a year, it’s not going to be exciting to gain $100 at the end of the same year through trading. This comes down to patience, and whether or not you have any. Most people I know don’t. This is why most small traders have major issues, as the lack of significant reward makes it difficult to stay focused. This leads to over trading, or over leveraging your position. When we first start trading Forex, we most often play what is known as a “market order” to get involved. You simply click the button to buy or sell and get involved. The market order tells the broker that you want to get involved to the best price possible, or what is known as the “market price.” There is no guarantee that you will get the price that you see on the chart or order window, but as Forex is extraordinarily liquid, most of the time it works out. 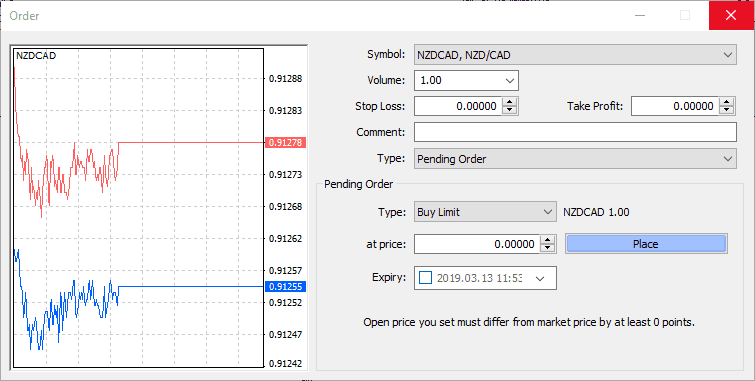 Pending orders in Forex, or any other market for that matter are a set of instructions that you give your broker on entering or exiting a position. Sometimes with more complex platforms, you can have multiple actions in the same order. At its most basic level, you are looking at a scenario where you are telling the market you wish to get in or out of a position at a specific price. If the market does not reach that price, then nothing happens. There are multiple types of orders but will take a look at the most basic ones that you are most likely to find. When you begin to trade Forex, you are inundated with a whole host of new terms. One of the ones that you will most certainly run into is what is known as “slippage.” Simply put, slippage is a difference between the price you see and the price that you pay. For example, you may find yourself looking at the EUR/USD pair with an ask price of 1.1267 as you press the button. However, you notice that you got filled at 1.1269. This is what would be slippage, by two pips. The fact that you got slipped on the trade isn’t necessarily a nefarious thing. Unfortunately, in the past there were several Forex brokers that would take liberties with their clients. This was long before currency trading became much more common, and perhaps regulated in larger countries. After all, even places like the United States were a bit behind it when it came to investor protections in the Forex markets, because it was a sudden explosion of interest that caught many regulators off guard. Beyond that, it’s a noncentralized market, so it’s very easy to see how difficult it was for regulators to get their hands around the entire situation. Fast-forward to present day, and most Forex brokers are heavily regulated. (In fact, if you are working with a Forex broker that is not regulated, you should withdraw your money immediately and place your money in a more reputable broker.) While one could make an argument that it’s awfully tempting to slip your customers every time, they try to place a trade, the reality is that most accounts aren’t large enough for that to make the risk acceptable to a broker even if they were less than honest. The fines that some of the regulatory bodies have laid out on brokers over the last several years had been massive, and it has cleaned up the industry drastically. With the average retail account being roughly $2000 in the United States, a few cents here and there simply will be worth the millions of dollars that a brokerage would face. Research shows that accounts around the world are roughly the same size on average as well. The math simply doesn’t work out. I’d be willing to bet that over 95% of the time that I read some type of negative review online about slippage at a brokerage firm, it has something to do with trading the news. Trading the news is a sucker’s game, and although you can get very lucky occasionally, you need to understand that liquidity is a major issue. What this means is that there aren’t as many orders. So for example, if you are looking to buy the Swiss franc, there needs to be somebody willing to sell it. When you put in a market order, you are telling the broker that you want to buy the Swiss franc at the best price available. What do you think that means if that best price is three pips away? Exactly. You just bought the Swiss franc three pips away from the price you are looking at. This has nothing to do with the broker, they are simply there to match orders. If there’s nobody there to sell you the Swiss franc at the quantity you want, they are simply facilitating the order that you gave them. If you don’t want to be slipped while trading, you can put in a limit order, telling the broker that you are willing to pay this price or better for a currency. If the markets skip your price, you simply are not filled. At least you haven’t paid more than you wanted to.